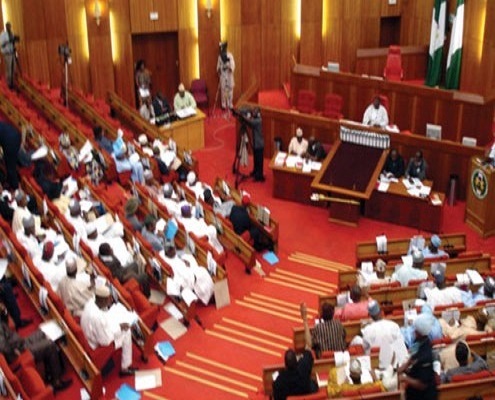 The Senate has suspended its plenary untill after next month’s presidential elections. According to a decision unanimously agreed upon by the lawmakers, the Senate will resume on February 19. “Dear distinguished colleagues, in view of the fact that it is after 2p.m., we cannot proceed any further so we have to adjourn accordingly. The senate hereby adjourns to Tuesday, the 19th day of February, 2019 at 10a.m. prompt,” the presiding officer, Ike Ekweremadu said while announcing. The presidential and National Assembly elections are slated for February 16. Before adjourning Thursday, the Senate gave a speedy consideration of the National Minimum Wage. The lawmakers passed the bill through the first and second readings after suspending the Senate’s rules. The bill was read for the second time and referred to an ad hoc committee for further legislative action. The committee comprises of Olusola Adeyeye as chairman, Abu Ibrahim (to represent the committee on labour), Shehu Sani (to represent the North West), Sam Egwu (South East), Suleiman Adokwe (North Central), Francis Alimekhena (South South), Solomon Adeola (South West) and Binta Masi Garba (North East).